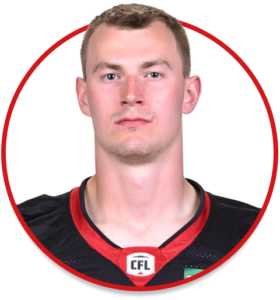 William Arndt is a quarterback currently playing for the Ottawa REDBLACKS. Holds several Western Connecticut State University records including passing yards in a career (7,940), total Offense in a career (9,248 yards), passing TD’s in a career (73), total TD’s in a career: 91 (73 Passing, 17 Rushing, 1 at WR) and 2nd longest run in school history (92 yards). While at school he also achieved 3-Time Team Captain, 2x All MASCAC Academic Team, 8-time MASCAC Player of the Week, 2-time New England Football Writers Gold Helmet Award recipient and ECAC Northeast Player of the Week. Also holds several single season records at WCSU.